12 states. Each different. From the most interesting and foreign for me – California, to Maryland and Pensylvania, that did not surprise as much. We arrived to California a week before the race. Beautiful days for me. Michal watched me as mental coach. 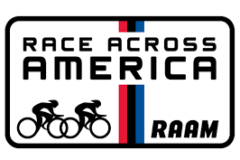 Relaxation, regeneration, massage, stretching, yoga on the beach and workouts on the RAAM route. My thoughts were only in the race. I knew that all other things are covered by the team led by Jarek who planned all very well. On the start line I stood fresh, but focused. The best discovery was that after a few days of racing, though I slept 2.5 hours a day, I had a fixed pulse rate and didn’t lose strength. It seemed like a full recovery every time. In addition, average speed stopped falling. Najlepsze było odkrycie, że po kilku dniach jazdy mogę spać 2,5 godziny na dobę, jechać ze stałym tętnem i nie tracić sił. Tak, jakbym się regenerował. Dodatkowo przestała nam spadać średnia prędkość.